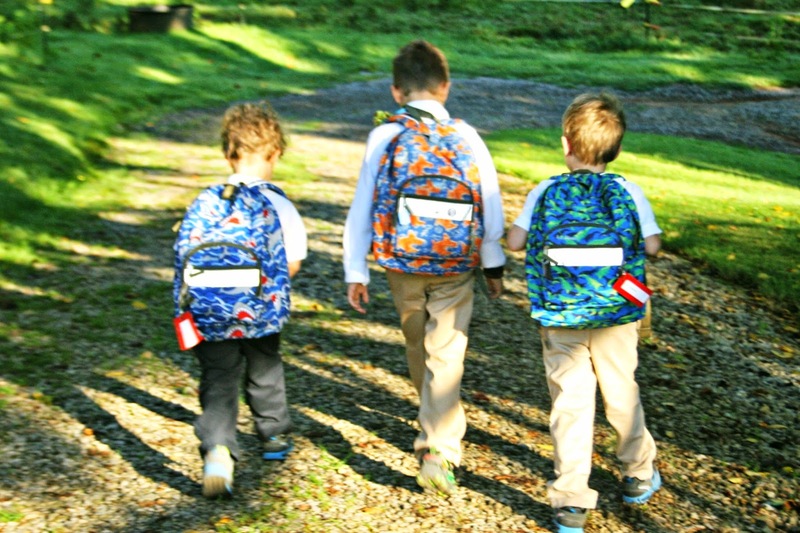 The boys have been in school for a few weeks already, and recently Nano-tex sent us a sampling of Gymboree clothes to put to the test. 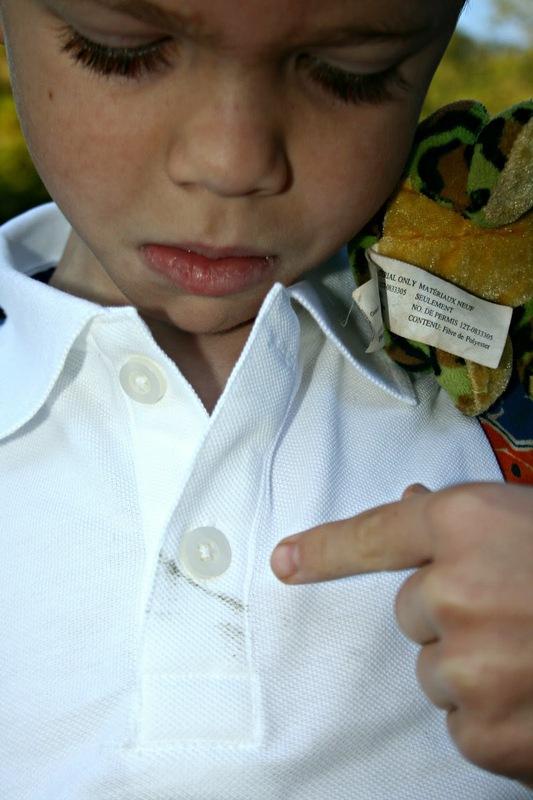 These clothes are play proof, and stain and wrinkle resistant. When I removed them from the box, I could immediately tell from the softness and feel of the pants that they were high quality. 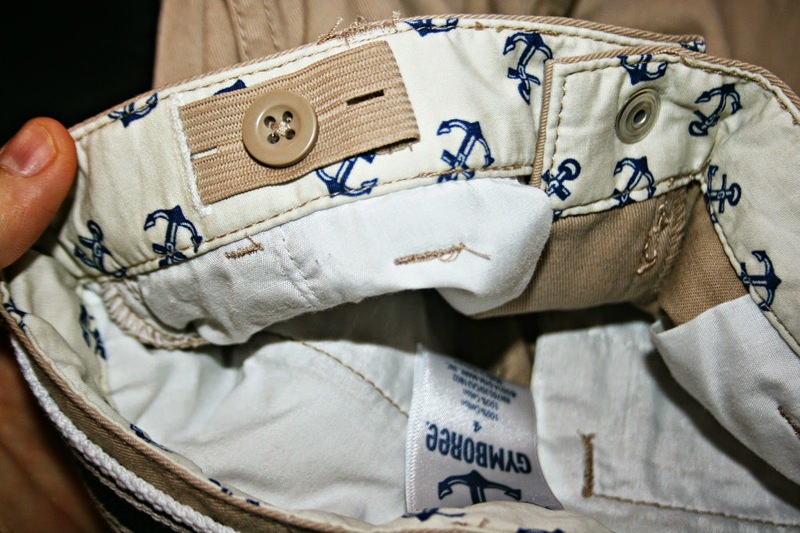 In addition, they had the most important feature for my three skinny boys - internal waist adjusters. If pants or shorts don't have these, my boys cannot wear them. They are just very slender. 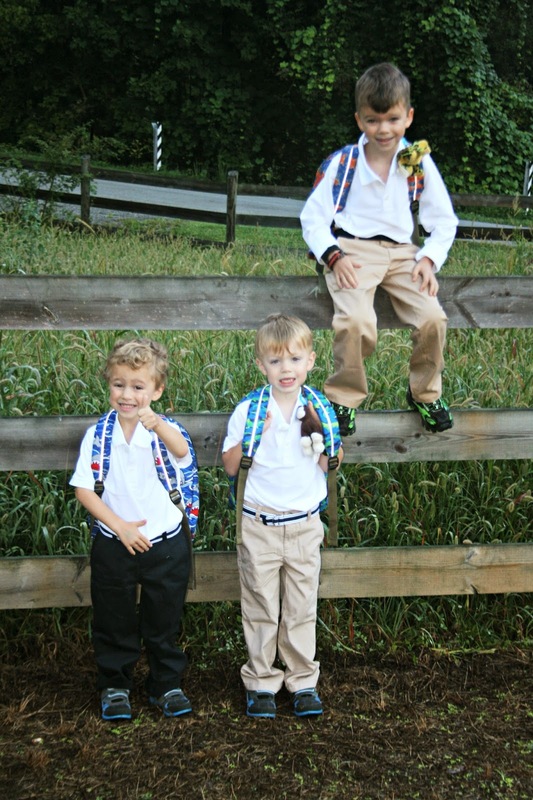 The boys attend public school, so they don't have uniforms, but they were so excited to get dressed up "like Dad" to go to school. I told them not to worry about getting their new clothes dirty - that we were testing them out. They looked really spiffy in their outfits. They loved having belts to wear with their pants. See Cort giving the thumbs up? Sadly, Pierce got a little dirty climbing on the fence. I told him not to worry about it. We'd let that stain sit all day long and see what happened. He also got some on his shirt. I was a little worried about these white shirts. My boys can really do a number throughout the day on a white shirt. To be truthful - I just don't buy white shirts because of that! By the end of the day, Cort's shirt was in the worst shape. He'd gotten tomatoes or something red all over it. And Pierce was playing with the chalkboard and had yellow chalk all over his. I did notice, though, that after wearing the outfits all day, they were not wrinkled at all. I stuck them in the wash and held my breath. Do you know what? Every single stain came out. Even the ones that had been on the fabric all day long. They looked brand new. Just the sort of clothes you can pass down to younger kids (even with boys who are tough on clothes, like my three). I think they will hold up well over time. Call me impressed! 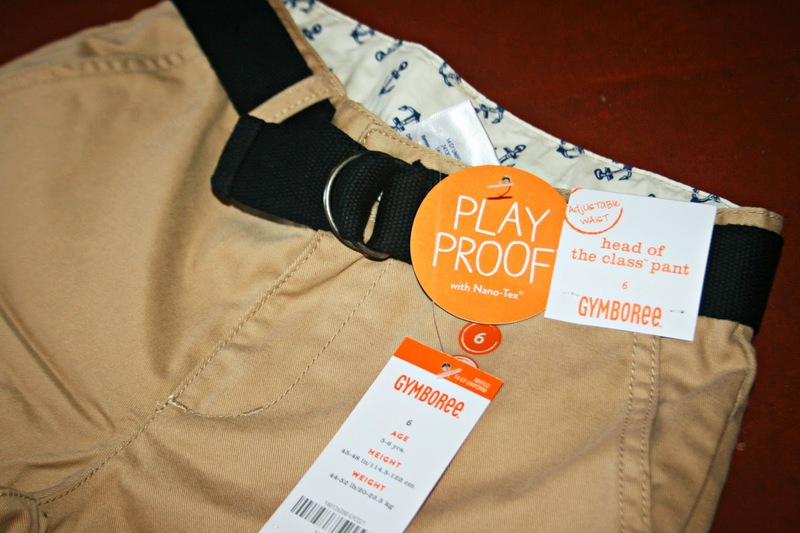 If you're looking for a play friendly nice outfit for your children, check out the Nano-Tex line from Gymboree. Disclaimer: I was sent three outfits to try for review purposes. The opinions above are my own. I was not compensated in any other way for this post. ja ja maar er moet ook geleefd worden zo worden ze wel groot. Too bad they don't make adult clothing. 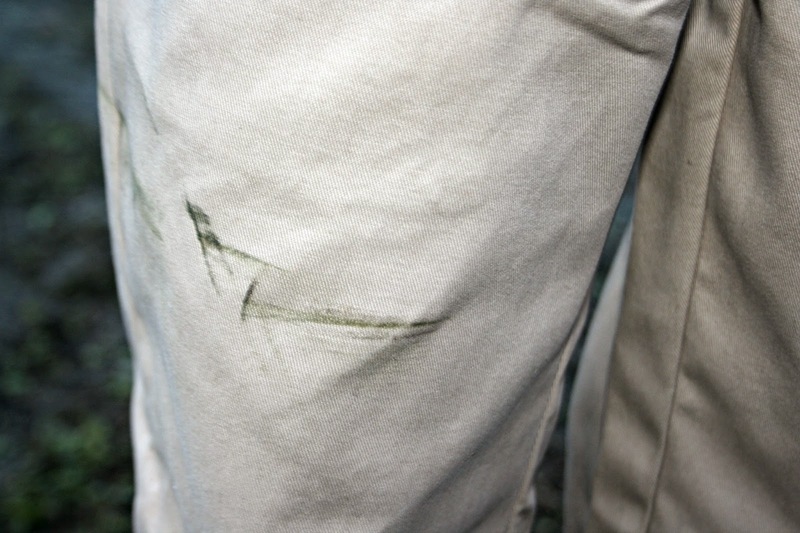 I crawl around people's homes quite a bit and have stains on the knees of my pants. Wow - that says a lot of the quality, Lisa. The boys all look very nice. I wonder if these guys are the same company that makes "Nomex" flight suits and armored vehicle crew uniforms. Those are fire proof. They do look really handsome in these outfits. They would be perfect church clothes too. My D-I-L loves Gymboree and is always waiting for Gymboree Bucks and sales to go and buy. And I have bought quite a few things for Anne there, too. The same mall has Crazy 8's right across from it. I understand that it is owned by Gymboree but is more of a budget line. I have bought clothed there, too. Call me impressed too! That's smart thinking for clothes for boys. I will be checking them out. Great clothes - looks like they will wear really well. I love Gymboree. I'm kind of sad though. Mica is going to size out of their clothes soon. I'm buying size 12 shirts for him. He's only 9, but both my boys are so tall! I've always bought Gyboree because I can get them to go through 2 kids. I love the adjustable waist to! Sweet! I love those inside waist adjusters--that way they don't have to wear elastic-waisted pants and feel silly. My kids were always too thin for today's jeans too. The stores size everything for the chubby kids now, sadly. I will always buy high quality over cheap clothes any day--they are worth the price. If you divide the price by the number of wearings, you always come out cheaper than if you bought some junk that wears out quickly. Nice to see good quality out there! Play proof sounds like a mother's friend alright. Glad the stains came out! I agree! The outfits get a thumbs up from me.